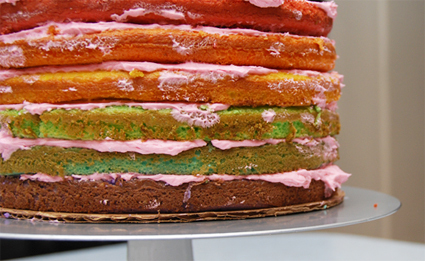 The layers of the cake were rainbow colored too! It was easier than it looks to make. Here are the steps for making your own. 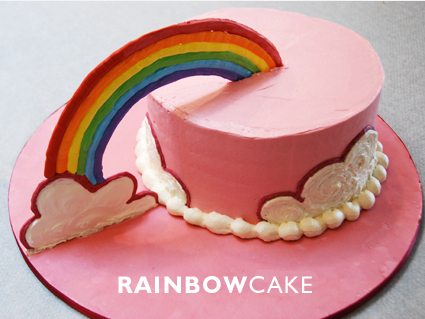 Make the rainbow decoration a few days ahead of time using Royal Icing which dries hard as a rock if you give it enough time. 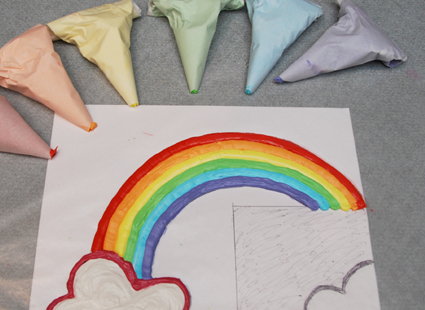 This picture shows how I first drew the rainbow on paper and worked out all of the design issues before ever attempting to work with frosting. I tacked it down to my counter top and covered it with waxed paper. This made a transparent work surface to trace. It was really easy. Whip the egg whites until soft peaks form. Gradually add the powdered sugar followed by the lemon juice and whip for 5-7 minutes until the frosting becomes light and fluffy. Cover or use immediately. It lasts for just a few days if refrigerated well. 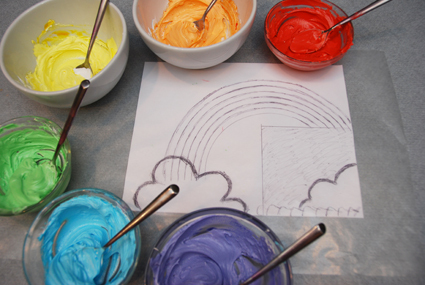 Here is what the rainbow looks like when you have piped the royal icing on to the waxed paper. Make sure not to leave any spaces between the colors – it will weaken the structure and cause it to break easily after you put it on the cake. Let this dry overnight to harden. 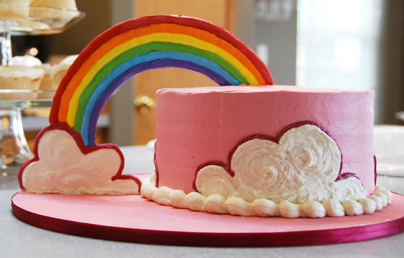 When you are ready to attach this to the cake, line the bottom of the cloud with frosting to adhere it to your cake board and gently push the rainbow into the top of the cake. To make the cake, you’ll want to separate the batter evenly so that each layer is the same size. 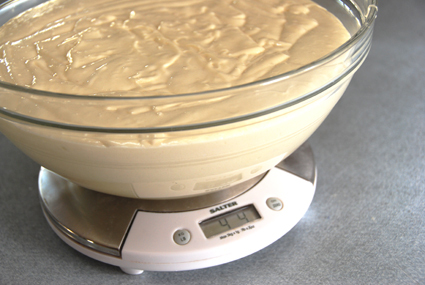 Start by measuring the entire amount in using a food scale, then divide by the number of layers you want to bake. In this case, I measured 4lbs. 4oz, and divided it evenly into 6 bowls each containing a little over 14oz. This is what the cake batter looked like when all of the measuring and mixing was complete. 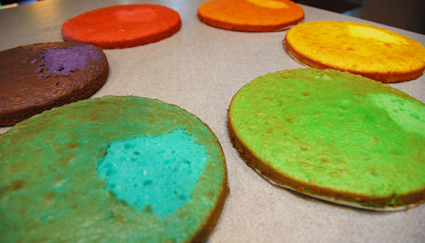 I love using gel food coloring in all my baking. It doesn’t add too much moisture to make frostings runny, and it is never lumpy or difficult to mix in. If you don’t have these, you’ve got to get them. 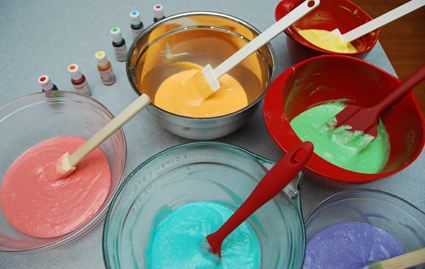 Don’t panic if the colors seem to brown up after you bake the cakes. They remain vibrant on the inside. I took this picture with some of the top layer peeled back from each cake to show the difference. Once the cake is layered and stacked, you’ll never notice the brown stuff. Each layer needs to be trimmed and leveled across the top before stacking and layering. This cake is not covered in fondant – just soft and tasty buttercream. 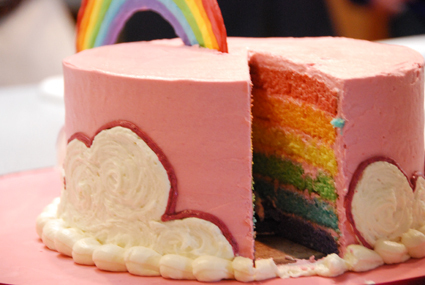 The end result is a simple cake with a vibrant accent that leads to the colorful surprise waiting on the inside.